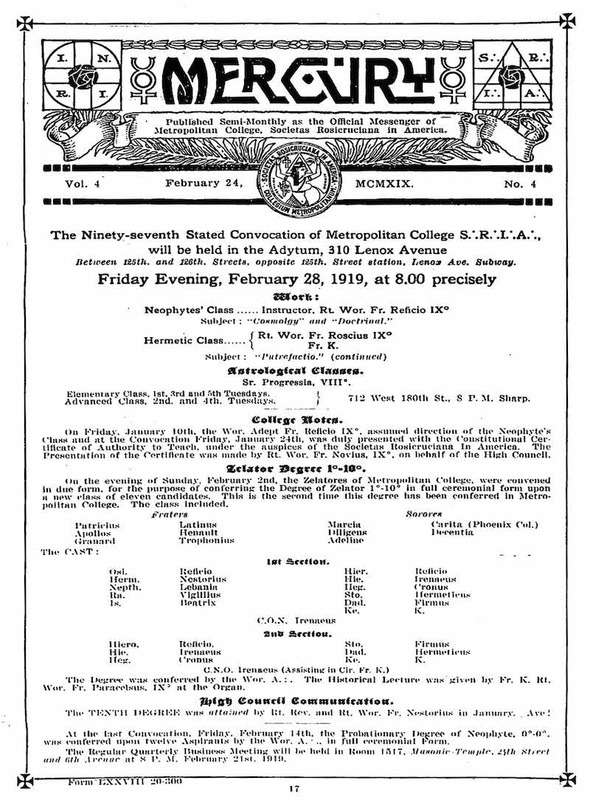 Publisht Semi-Monthly as the Official Organ of Metropolitan College, S R I A / A Rosicrucian Messenger of Constructive Philosophy / A Rosicrucian Magazine of Constructive Philosophy / A Journal of Esoterism and the Higher Mercury / America's Oldest Esoteric Magazine. New York, NY. Publisher: Mercury Publishing Company. Editor: G. Winslow Plummer; Henry Van Arsdale Parsell and George Arthur Logan, associate editors. Corporate author: Societas Rosicruciana in America1/1, January 10, 1916-1933. This was the organ of the Societas Rosicruciana in America, run by G. Winslow Plummer ("Khei," 1876-1944). The society should not be confused with the Societas Rosicruciana in Civitatibus Foederatis or the Societas Rosicruciana in Anglia, or the Societas Rosicruciana in Deutschland. The curious spelling in the subtitle and throughout the journal is an affectation of the movement to rationalize the spelling of English. Originally the journal was little more than a four-sided lodge notice announcing meetings, awards, and the like, but it came increasingly to carry the outlines of Khei's teachings. The journal was eclectic in its early days, featuring short biographies of Max Heindel, Rudolf Steiner, et al., and also notices (largely cribbed from S.C. Gould's Notes and Queries and Rosicrucian Brotherhood) of the society's forerunners, such as P.B. Randolph, F.B. Dowd, Edward Homes Brown ("Eulis"), and J.C. Street. As might be expected from that list, the group's practice has a sexual basis. The journal is especially noteworthy because of its many extraordinary colored illustrations. Regular contributions by Plummer and Parsell, and also by Kenneth S.L. Guthrie, and articles by what seem to be members of the society, and advertisements for the society's courses, incense and altar breads, and for "The A to Z Horoscope Delineator," "School of the Chemistry of Life" (Inez Eudora Perry, following George W. Carey), correspondence courses in "Stellar-Numerology" by Artie Mae Blackburn, etc. The companion publication to the journal was Christian Mysticism, which was undated and unnumbered and issued irregularly. H.V.A. Parsell was a joiner and also a very reliable historian of the various orders and groups he joined. As with most organizations of this kind, members were also offered a series of "lessons," printed but not published to the world at large. These constitute a Rosicrucian Series, Occult Science, which had at least 24 issues. NYPL.